Holding memberships with more than 140 other higher education-related professional associations, the Higher Education Committee of 50 is a group of forward-thinking campus leaders tasked with developing policy solutions that will help surmount obstacles preventing students from enrolling in, paying for, and graduating from college. 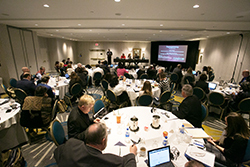 The National Association of Student Financial Aid Administrators (NASFAA) was awarded a grant to convene this group. Learn more.